In the small town of Ipswich, Massachusetts, the new year will mark a milestone in the city’s history. In 2009, Ipswich will celebrate its 375th anniversary. Throughout the year, the town will hold a multitude of community events, educational programs, and outdoor activities to commemorate the past, present, and future of Ipswich, Massachusetts. As part of the festivities, local brewery Mercury Brewing will be releasing, in limited quantity, 1.5 liter bottles of strong ales. The series will include an Imperial Stout, a Summer Barley Wine, a Double I.P.A, and a barrel aged Old Ale. 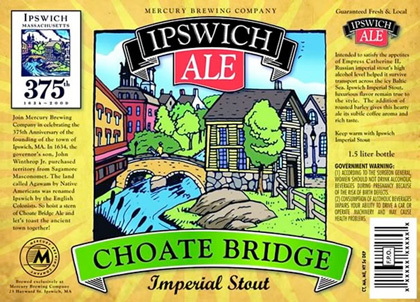 The first strong ale to be released will be the Choate Bridge Imperial Stout. Russian imperial stout was originally brewed to satisfy the Czarist courts. Because it was transported across the freezing Baltic from England, imperial stout was brewed with a high level of alcohol. Our Choate Bridge Imperial Stout may not be sailing over the Baltic Sea anytime soon, but the rich, flavorful, deep chocolate color and flavor will remain true to the style. The use of roasted barley gives this hearty ale its subtle coffee aroma and taste. The first 20 cases, or 80 1.5L bottles of Imperial Stout will be sold right out of the brewery on a first come, first serve basis. Each of these bottles will also be numbered as they come off the bottling line. I will add this to the News section of the 375th website! Very interesting information. I learned something!